4 nights in Bangkok and it was time to head north to Chiang Mai. A group of friends I had met in Bangkok were also heading the same way and so we booked our night bus for £9 from an agents on Koh San Road and set off on the overnight trip. We decided to find a hostel on arrival. With the arrival time being 5.30am, this was not as easy as we thought, but after an hour or so we agreed on a little guesthouse named Darets at a price of 100bht (£2.14). The room was very basic with no common area so we decided to stay for one night only. The following 3 nights we spent in Deejai Backpackers at a price of 175baht (£3 approx. )for aircon and the last night at 80baht (less than £2) for a fan. On my first day I explored the city and was quick to notice Chiang Mai was so much quieter and cleaner than Bangkok and the local people were so happy and friendly. To the amusement of friends and family back home, who know I do not like to spend time in the kitchen, I took an evenings Thai cookery class and I really enjoyed it! The chef took us to the local market and did a ‘show and tell’ of some of the ingredients we would be using. Back at the kitchen we chose which dishes we wanted to cook. 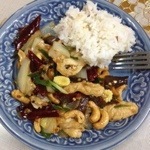 I chose, spring rolls, chicken in coconut soup, Chiang Mai noodles & chicken curry and stir-fry chicken and cashew nuts. My dishes turned out perfect, (yes, we got to eat everything we made), with the exception of me adding too much lime to my soup. Whoops! The class was carried out by Baanthai Cookery School and cost 700baht. Which included transport and a receipe book. The following day it was time to work off all that food and I set off on an all day trek which included a stop at a waterfall where we could cool off. 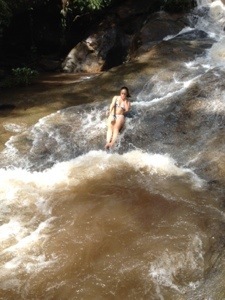 The rocks were so smooth we were able to slide down the waterfalls. So much fun. 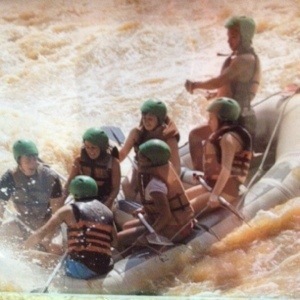 After a 40 minute elephant ride we were taken to the river and this is where it got even more fun – white water rafting! This was my first time and I was really nervous to begin with, but once I hit the first rapid the adrenaline kicked in and it was fantastic. My last day in Chiang Mai I wanted to visit Wat Phrathat Doi Suthep which is one of the most famous temples in Thailand, and is situated high up the mountain. A tuk tuk would charge around 500bht to drive you up there but luckily for me a guy who works at the hostel offered to take me and my friend there. The temple was as lovely as expected, but another spectacular vision was waiting for me further down the mountain – Wat Palad! This temple is not likely to be found in travel books, but I was lucky enough to have my own personal tour guide who had actually spent time there living with the Monks. 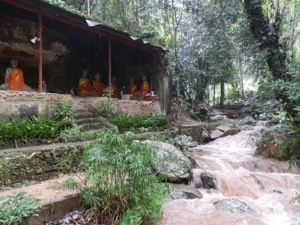 The temple was built as a rest point for Monks making the journey by foot up to Wat Phrathat Doi Suthep and is hidden away from the main road and built amongst a soothing natural waterfall. 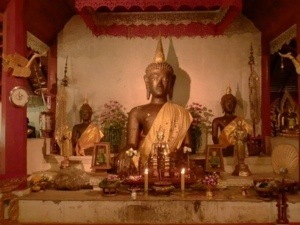 This temple is by far, the most authentic, majestic, peaceful, temple I have seen, and I have seen many many temples. I jus wish the pictures did it better justice. This was a fantastic end to my time in Chiang Mai but I had one more thing I wanted to do – a traditional bamboo tattoo to remind me of my travels. I chose to have a small Lotus flower on my hip; the Lotus is an important flower in Thailand and in the minds of the Buddhists, the flower stands for purity of spirit. Although it is rooted in mud, the plant is able to rise up above the dirty water and yield a flower of such perfect beauty and purity. And so, after some great experiences and fun nights spent with new friends it was time to head west, to Pai.